CONCORD, Mass.– Welch’s, the world’s leading seller of Concord and Niagara grape-based products, introduces a new flavor to its classic sparkling portfolio with the launch of Welch’s Non-Alcoholic Sparkling Mimosa. Sparkling Mimosa lets everyone join in on spring celebrations and raise a glass with a deliciously sippable brunch beverage. 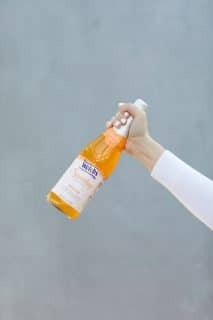 Welch’s Non-Alcoholic Sparkling Mimosa offers a burst of citrus with a light, crisp taste, making it ideal for families, expecting moms or those looking for a refreshing non-alcoholic brunch beverage. Welch’s Sparkling Mimosa brings everyone’s favorite mimosa flavor to the brunch table without the champagne hangover. Welch’s Non-Alcoholic Sparkling Mimosa is made with USA-grown grapes, sweetened only with fruit juice, has no added sugar and is only 80 calories per serving. It will be available exclusively at Target stores and on Target.com starting April 7. Welch’s Non-Alcoholic Sparkling Mimosa will be a permanent addition to the Welch’s sparkling juice line and will be available in 24.5 fl oz. bottles at an SRP of $3.19. Welch’s, the world’s leading seller of Concord and Niagara grape-based products, is a co-op of more than 800 family farmers located across America and in Ontario, Canada, with 100 percent of company profits going back to the farmers. Welch’s is committed to research and development that will meet the growing demand for products that address consumers’ health and nutrition needs. Welch’s products are sold throughout the United States and in approximately 40 countries around the globe. Welch’s is an Equal Opportunity Employer-Minorities/Female/Disabled/Veterans.